1964 Chevrolet Impala SS is a real, numbers-matching SS, and it's an honest, straight, driver-quality car. This car has been refurbished "as needed" over its 45-year life, but never completely disassembled and restored. Cars are only original once, and this one is just too nice to take apart. You can get in, turn the key, and set off on a trip across town or across the country in this car without thinking twice. It looks great, has a rumbling 327 cubic-inch V8 with factory air-conditioning, and the top goes down�what more could you ask? 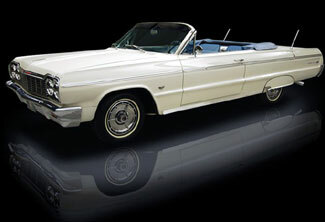 The drive-train on 1964 Impala SS has only 84,512 original miles on it, is still strong and willing. It's a 327/250 with a Powerglide, which is about as durable and trouble-free a combination as GM ever put in a car, and it runs better than a lot of freshly restored cars we've seen. It's had some recent work to keep it in top condition, including a rebuilt Rochester 4-barrel carburetor, new fuel pump, new spark plugs, and a new correct exhaust system. The engine compartment has been recently detailed, and it shows incredibly well for a car that has been driven regularly. Someone spent a lot of time and effort dressing it up. Inside this Impala SS, you'll find the SS-specific bucket seats with engine-turned console and dash. On this car, the interior is a combination of original and restored pieces, including new carpets and seats. The polished trim is still sharp and blemish-free and the original door panels are outstanding.